A second infographic from Ivan Cole’s website, Afrographique, features a topic that came up in several interviews with market women, specifically cloth traders, in Ghana: China’s influence in African trade. According to ChinaDaily.com, China’s trade with Africa in the first half of 2012 expanded much faster than China’s overall foreign trade. During the first five months of this year, China’s imports from Africa rose by 25.5% to $49.6 billion, while its exports to Africa grew by 17.5% to reach $30.9 billion. 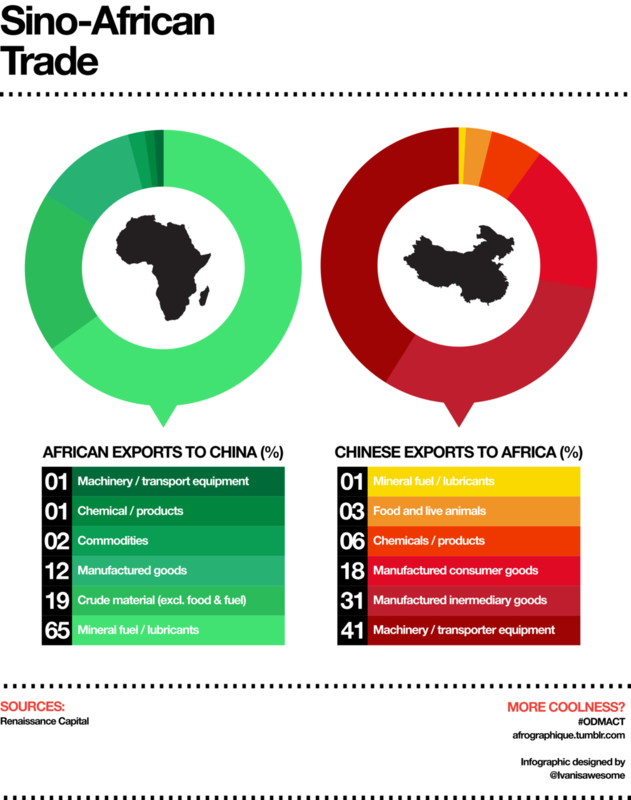 The above infographic depicts a macro-view of the nature of this trade, indicating that Africa exports mainly mineral fuels, crude material and manufactured goods to China while importing primarily machinery and manufactured intermediary and consumer goods. In our interviews with Ghanaian market women, we learned about some of the implications of this trading boom on a micro-level. A Ghanaian cloth seller whom we talked to said that Chinese competition has made the cloth trading business much more difficult. Locally manufactured cloth is often unable to compete with much cheaper, imported Chinese cloth. Ivan Colic, art director at Zoom Advertising Cape Town, uses infographics to tell stories about a side of Africa that the press mostly neglects to tell. On his blog, Afrographique, he visualizes the continent’s incredible innovation, entrepreneurship schemes, art and history. 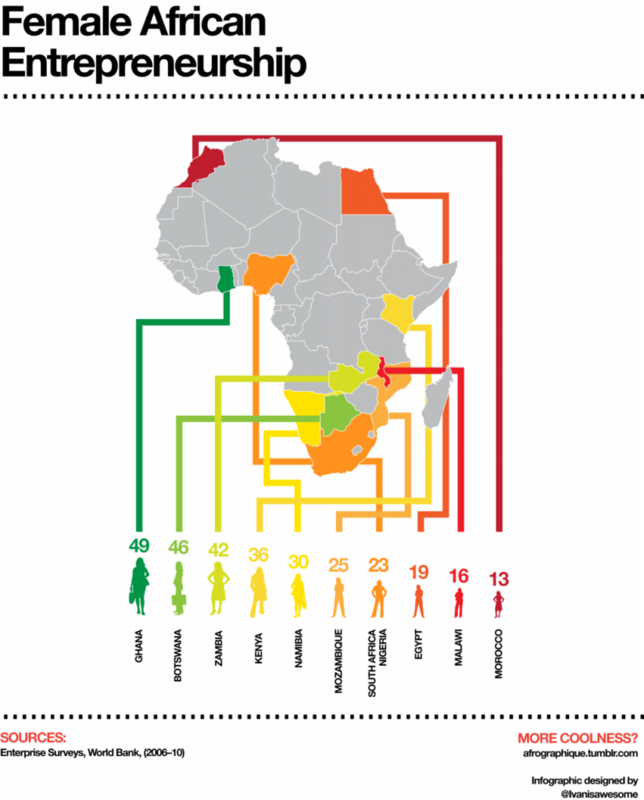 This particular infographic depicts the percentage share of formal firms that are owned by women in Africa (based on the World Bank Enterprise Surveys 2006-10). Noteworthy is that female entrepreneurs own nearly 50% of firms in Ghana. The 30% of female-owned firms in the US in 2007 (US Department of Commerce) pales by comparison. On this site, we’ve profiled female entrepreneurs such as the cloth seller at Makola Market in Accra, Ghana. For more profiles of women who’re working in other sectors, see for example, Business Insider’s Profile of Africa’s Top 5 Entrepreneurs.